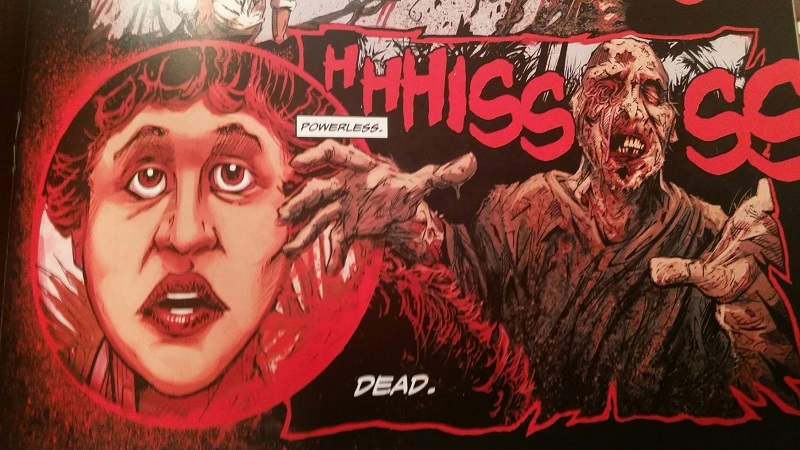 As issue #2 of Zombie ends, our ship of truth seekers have docked and disembarked on the zombie infested island of Matool, and Dr. Menard’s poor wife has been disembowled and devoured (at least partially) by said gut-munchers. Upon reaching land, the group are met by Menard. They get into his Jeep and make the drive to his clinic, the doctor presently oblivious to his wife’s fate. The 3rd issue begins with that drive. Menard informs Ann, and more so the reader, of the depths of her father’s involvement in the studies of life after death. This includes his own dealings with the island’s “witch doctor”, Biacando. This bit of backstory culminates with Ann’s father’s death at Menard’s hands (kinda), as well as the doctor’s not-so-successful attempt at taking down Biacando as well. The recap of previous unexplored events ends with Menard sending the group to his house to freshen up, and check in on his wife while there. Anyone familiar with Lucio Fulci’s original film knows what will be found when they arrive. They may even expect the carnage to be more explicit in its drawn form as the artist’s imagination isn’t limited by the budget constraints of film. Where the comic really establishes its own personality is in the emotional reactions of its characters. The comic’s creators allow the characters to once again display a more developed emotional response to their situations, thus filling in more of their personal backstories without ever straying so far from the source material that it feels like a “bastardization”. After a bloody battle inside the Menard residence, the issue concludes in the nearby cemetery. This is also where Susan has her face to face encounter with “Worm-eye”, the film’s infamous “poster child” portrayed by Ottaviano Dell’Acqua. 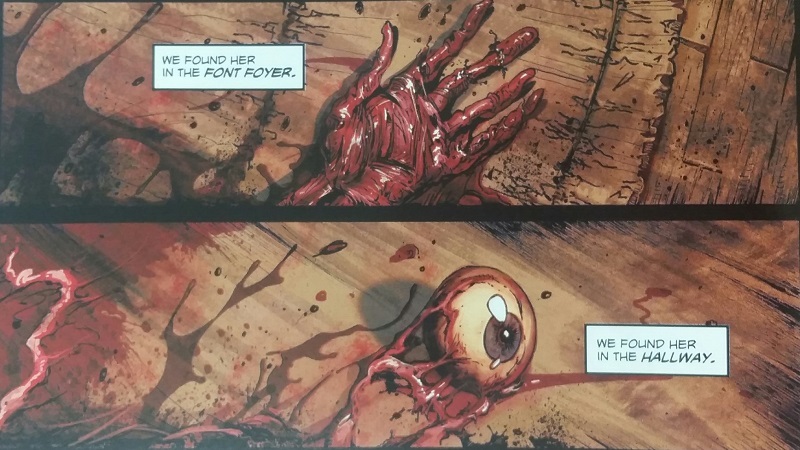 While the artist, Michael Broom, did take a few minor liberties with the amount of blood in his re-creation, the comic comes nowhere close to being able to capture the magic of that scene. That isn’t a strike against Broom by any means. As one of the film’s more iconic scenes, the task of faithfully recreating it via a different form of media was surely daunting, to say the least. Inks by Derek Rook and Gerry Coffey really bring an extra “pop” to Broom’s pencils. As with previous issues, the blood and grue fill the pages with a sea of red, yet never bleed into the multiple oranges of fire and island sun. Rich black borders accentuate the carnage spilling from panel to panel. As has become the company’s trademark, the issue is loaded with Eibon Press swag. 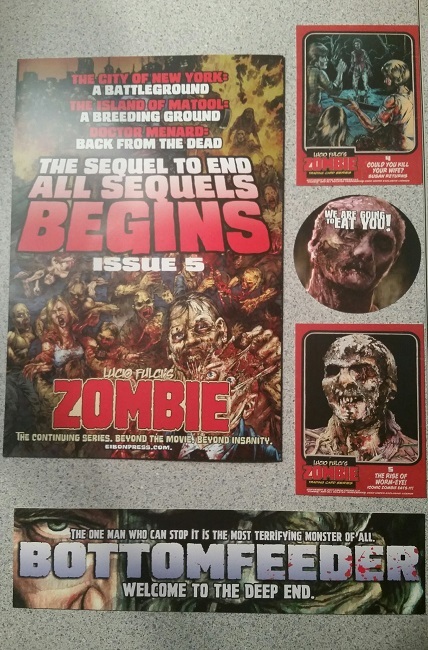 In addition to the staple Eibon Sleeve, the issue comes packed with trading cards, a bookmark, a sticker, and teasers for both Eibon’s upcoming Bottomfeeder series, as well as the 4th issue of the Zombie series. Be sure to keep an eye out for that one as the first 700 copies will include a 5 inch vinyl comic soundtrack from the film’s original score composer, Fabio Frizzi.